Damh brings us the qualities of grace, majesty, and integrity. Comtemplating the stag can help you achieve a greater sense of poise and dignity. If you are ever confronted with a situation in which you feel vulnerable or under scrutiny, such as in a court of law or public appearance, by attuning to the stag and asking for the protection of his spirit you will find yourself feeling calmer, sronger, and more dignified. The stag signifies independence too - both spiritua and physical. By drawing this card ou will be able to find the strength to gain and maintain your independence. It's auspisious to draw this card when contemplating new projects. The stag's connection with fertility and sexuality will let you find a way to bring diginity, grace, power and integrity to your sexual life. from "The Druid Animal Oracle"
I love the stag. His strength and dignity are at one earthy in nature, and also deep pasion of life. In casting our circle we spend time with stag, who accompanies Michael "with the passion and heat of the noonday sun". In meditation he cmoes in his strength and empowerment. A very dear friend of mine was accompanied by stag on a very challenging journey and was very empowered to make changes and see the results of unwanted energies being consumed by Stags heat and fire. It was a very p[owerful and releasing moment. I'm currently reading a book on Tibetan magic. [Tibetan Magic and Mysticism, by J.H. Brennan].It discusses the Tibetan view of the chakras which puts the deer/stag at the heart center because the heart center characteristic is movement and speed (heart center controls circulatory system), which is a characteric of the deer. I'm a priestess of the Mayan Temple of the Deer, which honors the gentleness (equated with loving compassion) of the deer. So I'd also see the Stag as an embodiment of quick movement, and of gentle compassion. This may not work for everyone! Just a couple of thoughts. Season of ice: this is my news! I put that poem to music and sing it every year at this time of year, with the coming of winter. I'm not sure what type of deer this is, but some species lose their antlers in the spring and grow them back during the year, to a greater degree each time as they age. Although I see no evidence of fallen leaves, the colours overall in this card remind me of autumn. I like the fungus at the base of the birch tree. The birch itself is generally a symbol of renewal or beginnings. What might they be indicating? Why birch trees? I'm unfamiliar with the four plants in the foreground of the card, but the DAO book identifies them as pennycress (deer's pot-herb), mountain sorrel (deer's sorrel), common asparagus (deer's son's leek), and heathrush (deer's oats), which it indicates are all associated with deer. It seems as though they are all full-grown and mature, unlikely if this were the season of spring before the birch trees even had catkins! Here's a pic of Damh, while you wait to get the 'official' DAO pic with the boarder around it. Location: Out in the desert. Go figure. I thought I'd share my experience with the stag... it is amazingly close to the description given by the DAO. When my mother and I were camping, to our horror we discovered several elk that had been poached for their antlers.. the 'hunters' (murderers) that took their lives took only their racks and/or their heads.. leaving their bodies to rot. I could tell they were killed out of hunting season, which would probably explain why they were killed at all as most animals know when it's time to hide and when it's ok to roam at liberty. We said prayers for each elk that we found. We then came upon an elk who's skull was left behind. I asked him if I could help restore his dignity by honoring his skull in my home.. I felt that this would be welcome. He even seemed grateful that I'd take him in even though his antlers had been sawed off. Time passed as I washed his skull and carefully put his teeth back in place. As 'coincidence' would have it, the elk was ready just as I was moving away from home for the first time. From the first day I was away, the elk has kept watch over me and my new life. His spirit is a strong presence in my apartment.. it is loyal, protective, and strong. He enjoys my attention as I surround him with little treasures I find from outside: pinecones, some pretty bark, feathers, etc... It is a good friendship. I'm blessed! The Stag-Damh came into my reading today, and I must admit I couldn't be happier to feel his presence. I feel as if I am starting a new chapter in my life. Recently due to a goofy disease I'd become consumed with wondering what other people thought about me and I let these feelings of inadequacy color my life in dismal shades. No more of this! I am independent and I will stand tall with dignity. I will honor my commitments and thereby strengthen my integrity. This is indeed a new beginning for me because I let myself become weak. With the spirit of Damh, my soul feels stronger, and the fire burns brighter. Still, I must remember not to go crashing about recklessly, there is a lot to be said for the state of grace. In the tale of Culhwch on p. 28 of The Druid Animal Oracle; Culhwch must perform thirty-nine impossible tasks to achieve his goal. With the help of King Arthur and his knights Culhwch accomplishes what he set out to do. However, the most daunting task is to free the Mabon from the Underworld. The Stag doesn't have all the answers so he sends the seekers to the other totem animals for guidance on their quest. It is this way in my life also because I need to seek wisdom and renew the balance in my life to achieve my own "impossible tasks". Keep the fire burning everyone no matter how hard the journey seems, let it give you strength. I am glad I could give you some inspiration, and thank you for the compliment. 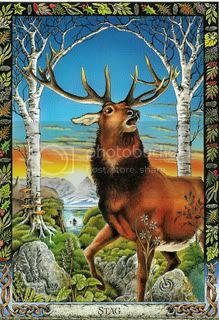 The Stag is a very inspiring card indeed! I am finding that if I imagine myself as a Stag the antlers make me feel taller and able to deal with situations in a much better manner.